The Conscious Cat has a new family member! Amber and I are excited to welcome Allegra into our hearts and into our home. Well, right now I might be a little more excited than Amber, but so far, things have been going really well. Amber is watching the newcomer from a cautious distance, and if she comes too close for comfort, she lets Allegra know who’s in charge. I found Allegra on Facebook on the Great Falls Animal Hospital Cat Adoptions page. When I contacted the page administrator for more information, I was told that she was seven months old and “very very sweet, loves cats, loves dogs, loves people, loves life!” I knew I had to meet this little girl. The first time I met her, I spent about an hour in an exam room with her. She was your typical ADHD kitten – discovering and exploring everything, whether it was a stethoscope hanging from a hook on the wall or a syringe cap on the floor. She didn’t pay all that much attention to me, but I started to fall in love with her anyway. However, I didn’t want to make a hasty decision. I had only just begun to even think about bringing another cat into our lives. I didn’t know whether I wanted a kitten or an adult cat. So I went home, slept on it, thought about it – and I just couldn’t get Allegra out of my mind. I went back to see her again the next morning. And that’s when I just knew. She was meant to come home with us. Her background, as far as I know it, is this: she was rescued from a county shelter in Maryland, and fostered by two different foster moms. Her most recent foster mom described her as a “total love bug lap kitty” who loved to follow her everywhere. I brought her home yesterday morning. And so a new chapter in our lives begins. Allegra spent most of yesterday exploring her new home. She was particularly fascinated by windows – something she hadn’t been able to enjoy for the last ten days when she lived at the animal hospital. Everything seemed to delight her – bumble bees flying by, leaves blowing in the wind, squirrels rushing by outside. It’s so much fun watching her discover her world. Amber is not so sure this was a good idea just yet. I’m sure you’ll hear all about it from Amber herself soon. And you never know, Allegra might eventually want to contribute to The Conscious Cat, too, once she adjusts to her new home and new life. How exciting for all of you. Lucky girl to have such a wonderful home. Thanks, Wendy – things are going really well for all three of us. Welcome, Allegra! She’s beautiful, Ingrid. I am glad to hear she is fitting in well and that Amber is coming around. Oh Allegra – you have no idea the amount of fun and pure joy that will be part of your life from now on! And somehow I think that Amber will definitely see the bright side of this too. She can think of Allegra as the little sis…the partner in crime…the assistant! LOL Congratulations Ingrid! Welcome to the family, Allegra!! You are so cute!! I am so excited for you. I wish you a great life beside your sister and mom. I’m sure you will love them very much for many, many years!!! Thanks, Debbi and Terri. Amber is adjusting amazingly well. Layla, apparently Domino’s admonishment is working – I’m astonished at the difference after just 24 hours. And I promise, more photos soon. She’s beautiful! So wonderful that you are able to give her a forever home. About the mycotoxins in the corn-based cat litter, just breathing them in can cause all kinds of problems because the toxins spread easily into the bloodstream. It’s a big issue for farm workers too. I usually always invite potential adopters to come and see my treasures and they usually can’t get them out of their minds either. Worked again. My two fosters are being adopted this week. Congratulations! With cats, it’s time, time and more time, to adjust. Marg, I know Amber will eventually come to love Allegra. And there’s no shortage of toys at our house! Thanks, Mason. Allegra is hard to resist, so I’m sure she’ll win Amber over eventually, too. ihavecat, she’s very sweet. 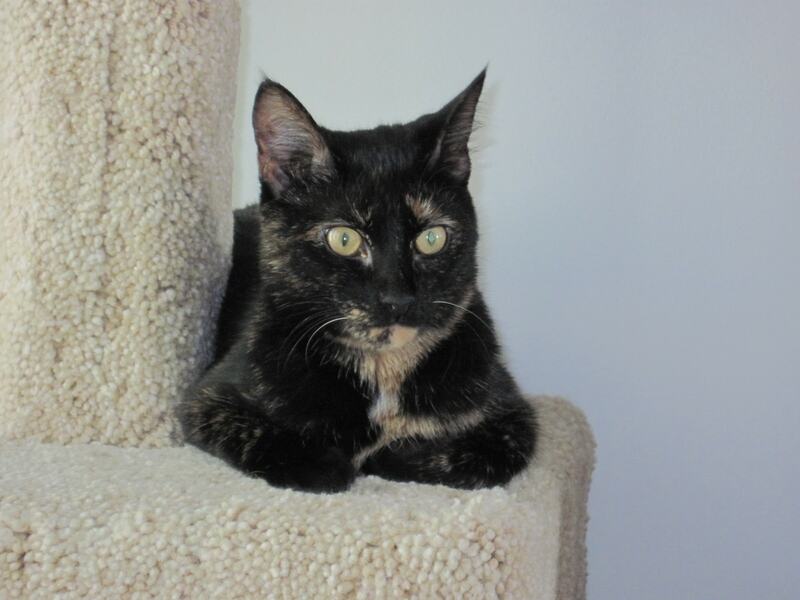 She’s a very dark tortie, her back is almost all black with just a few tortie markings. Oh how exciting! Allegra is beautiful. I’m sure she and Amber will become buddies soon! Best to you all as you get used to one another! so exciting! good luck and def give it time (as i’m sure you know). she looks so sweet! is she a Torbi? That is so exciting forAllegra to have a forever home. She is just gorgeous. I am sure Amber will get to like her and probably will be glad to have the company. We know that Ingrid is having a wonderful time opening up her heart again. What fun to have a kitten in the house. Guess you need to get tons of toys. Have a great day all three of you.